This innovative product helps protect your childs delicate eyes and skin from up to 65% of the suns heat, glare and UVA/UVB rays. It also provides protection from wind and flying insects. The specially designed mesh provides protection while still being transparent enough to allow children to see out and parents to see in. 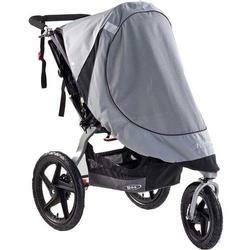 For use with BOB Revolution & Stroller Strides Strollers Specially designed mesh screen reduces exposure to the sun’s harmful rays. Attachment is simple to secure over the stroller.